We currently have an immediate opening for a full time junior Web developer. You will work closely with the design and development teams to develop modern user interfaces. This role will be responsible for implementation of designs into client formats, typically HTML/CSS and light JS. 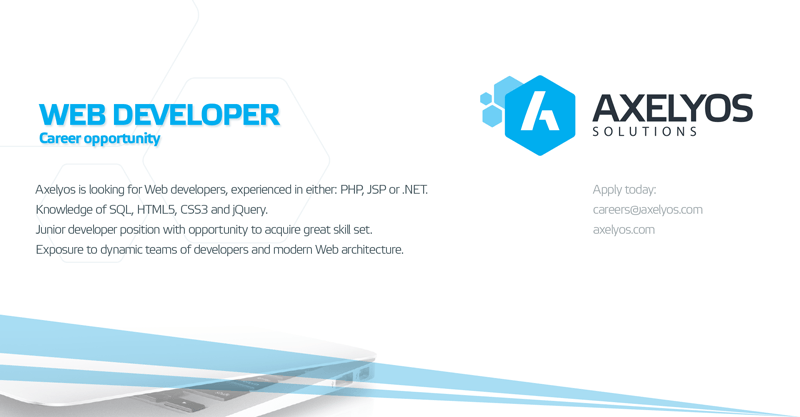 Axelyos is a software engineering startup from Bosnia & Herzegovina (Europe), focused on creating unique solutions utilizing state of art technologies. Whether it’s server side processing, mobile apps (iOS, Android, Windows Phone), Web apps, workflow management.